of the chairs, and the dimensions of the complete articles were as follow: Length, between 6 and 7 feet; depth, about 30 inches; height of seat-frame, 14 inches; total height in the back, 3 feet 1 inch. Figs. 1 and 4 are the most characteristically " Heppelwhite" of the set, for Fig. 6 has rather more squareness than is usually associated with the style; while Fig. 7 partakes largely of the " Louis-Quinze " element, except in the legs which are quite " Sheraton" in feeling. Heppelwhite refers to the design illustrated in Fig. 8 as a 44bar-back" sofa, of which he writes: 44 This kind of sofa is of modern invention, and the lightness of its appearance has procured it a favourable reception in the first circles of fashion. 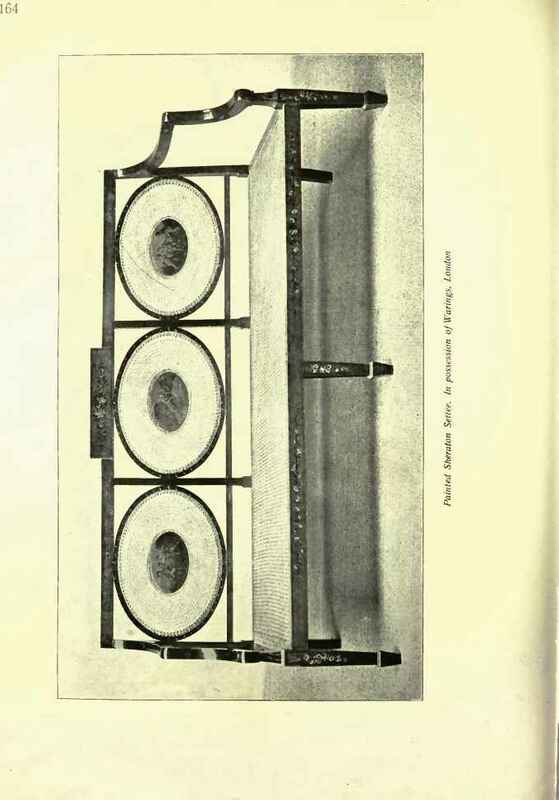 The pattern of the back must match the chairs; these also will regulate the sort of framework and covering." Fig. 2 is a simple stool, also on 44 Louis-Quinze'' lines, and Fig. 5 is a graceful little "window stool to be made in mahogany or japanned, and covered with linen or cotton to match the chairs-"
Now that we have remarked how "Heppelwhite" compares with "Chippendale," and, in a measure, with "Sheraton/' with respect to the many factors which go to make up the style individually, and have judged each on its own merits, let us glance for a moment at a furnished " Heppelwhite " interior, side - by - side with one belonging to the earlier period, as they are depicted on Plate IX. in this chapter and on Plate VII. in my chapter on "Chippendale." By this means we shall find ample justification for the remarks with which I commenced this review of the later style. they really give us the keynote of all this designer's work, and clearly indicate the spirit which actuated him in the accomplishment of everything he undertook. He saw perfectly that a demand had arisen for a greater measure of brightness in the furnishing of the home, and that the public were no longer prepared to remain content with the gloomy dignity that had prevailed for all too long a time. 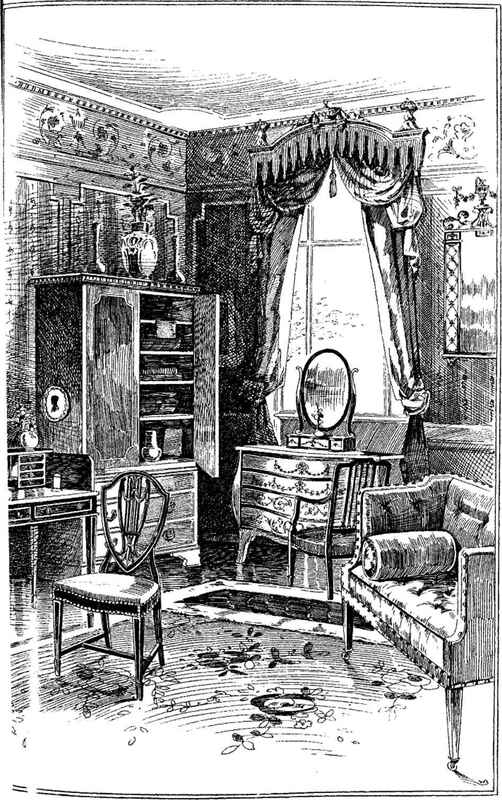 It was apparent to him that furniture of a lighter construction, exhibiting greater refinement in its enrichment, and providing something more inspiriting in point of colour than the somewhat sombre, though undeniably rich, tones of old Spanish mahogany was wanted; in fact, that the need for a higher degree of " elegance" absolutely must be satisfied. He accordingly set to work with a will to do all within his power to satisfy that demand, and, in his endeavours, he brought about many most notable changes. First, he recognised that strength, and consequent stability, in furniture might be secured most effectually without the aid of undue thickness of wood or heaviness of construction. Every part, therefore, that could be "thinned down," without the sacrifice of strength, was thinned down by him, and with admirable judgment and taste. That good and honest construction, notwithstanding this, was not sacrificed in the course of these changes is amply proved by the almost perfect condition of his productions which remain to us, and which, owing to their lasting qualities, are entitled to as great confidence as upon the day they were first made, over a hundred years ago. Elegance of form having been gained, the highest attainable refinement, and a greater variety of colour in the enrichment by which that form was to be beautified, were the next points to be considered, and in these directions Heppelwhite was again brilliantly successful.